We have categorized all forms of electric light into 13 categories. The Edison Tech Center spent 3 years researching and gathering information on each form of light and has condensed the material into pages on our main website and short videos hosted by lighting expert and collector Rick DeLair. Follow along as we explore all the cool ways you can make artificial lighting using electricity! 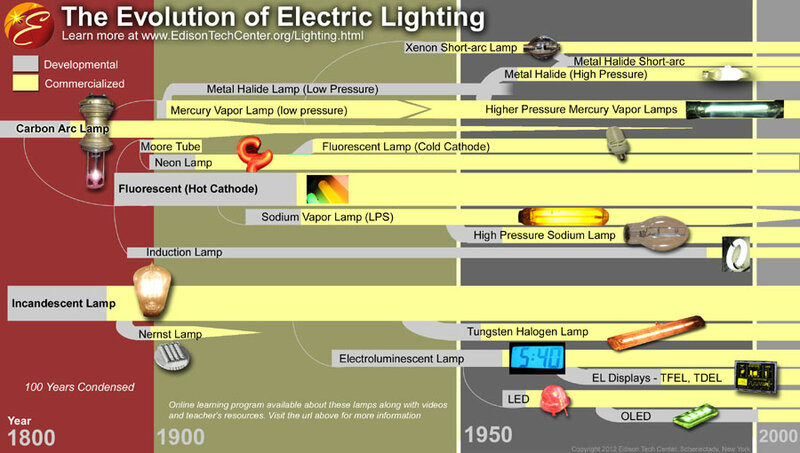 Below we have created a timeline that shows the origin and “families” of electric light. You can start with the basic science of light or the carbon arc lamp. If you’d like to have students take a test on all the forms of light you can have them use our test here. This program was sponsored by both the Edison Tech Center and the IEEE.